Beats is known for its superior audio quality in headphones. Beats Studio 3 headphone is also a good sounding headphone with some amazing features. If you compare the headphone with previous headphones of Beats, then the features are just updated. The headphone is stylish in looks but the performance of the headphone is above average in features if offers. There has been some improvement in the noise cancellation feature of the headphone. The best part about the headphone is its audio reproduction feature, which is indeed good. The trendy and sturdy wireless design of the headphone is amazing. The noise-canceling feature of Beats Studio 3 headphone is also good as it blocks the ambient sounds from the environment. You can indeed get a premium listening experience with the headphone. Beats Studio 3 headphone has a good battery performance. Up to 22 hours of playback with noise canceling feature and wireless connectivity is good for the price on offer. If you compare the headphone with other headphones in this range, then the battery performance is astounding. The Bluetooth connectivity of the headphone is good and there is no such problem in integration with other devices. The control scheme of the headphone is good and this is where it scores highest. The overall performance of the headphone is decent. Beats Studio 3 headphone has a great bass base. If you are a huge fan of bass, then you can go ahead and buy this headphone. It’s also good for all your outdoor activities. Is it for your long gym sessions? Well, yes you can use the headphone for your long gym and workout sessions. As the headphone is comfortable and it just fits you right, you can hear nonstop music with the headphone. There is no problem of audio leakage even if you use the headphone outdoors. Beats Studio 3 headphone is great for your music listening sessions even while traveling. As it features active noise canceling, it helps to block the sounds around to give you a clear audio quality every time. There is no disturbance in the sound performance. So, it’s great for your traveling needs. It’s also good for gaming if you enjoy playing games indoors. On track gaming can be fun with this headphone as the bass and frequency of the headphone is good. Though the headphone is sturdy in looks, it is comfortable. If you wear it for a longer time, you will not feel any kind of pressure on your ears. You can enjoy your long playlist with this headphone without any problem. There are many great features of Beats Studio 3 headphone, let us look at some of them. Beats Studio 3 headphone features real-time audio calibration. ANC continuously optimizes noise output to maintain precision and range for a great listening experience. The headphone has a responsive noise cancellation feature that blocks external sounds while giving you a great music experience every time. The feature lets you hear the sound clear and crisp. Beats Studio 3 headphone gives you the power to connect and pair the headphone with every device. But, the integration of the headphone is good with the Apple device. It lets you listen to music playlist with the Apple W1 chip and that is indeed a great feature of the headphone. In fact, its connection is good with every IOS device. The headphone offers 22 hours of battery backup so you can play your music on the go. This is when you switch on the noise-canceling mode. If you use the headphone without the noise cancelation feature, then the battery backup is up to 40 hours. The battery performance is indeed good with the wireless connectivity and other features of the headphone. Beats Studio 3 headphone features the fast fuel technology that helps to charge the battery in minutes. You can charge the battery for ten minutes to get a playback of up to 3 hours. This is a great feature if you are a frequent traveler. Quick charging feature is an added advantage of this headphone. The headphone has the industry-leading Bluetooth technology. Class 1 Bluetooth integration allows for comprehensive range, so you can enjoy music anywhere. The headphone lets you seamlessly switch between different devices to give you a great connectivity. The headphone comes with a carrying case so you can carry it along with you to stay tuned to your music. It comes with 3.5mm remote talk cable and USB charging cable. The headphone is available in many different colors so you can take your pick. Beats Studio 3 headphone is not only light in weight but truly comfortable. The ear cups are large and well padded. There is no pressure or added clamping even if you wear the headphone for a long time. In fact, because of its ear cup design, it fits really well. You can wear the headphones for outdoor activities as well as there is no problem with fit. The size is indeed big but there is no such issue of perfect fit. If your head size is small, there can be a slight problem in fit. The headphone scores big in comfort department as compared to other headphones that are available. The active noise cancelation feature of Beats Studio 3 headphone is average and not that great in performance. It does block the sounds around you but it does not completely isolate. It’s good for commuting purpose though. The active noise cancellation feature also blocks the environment noises but it depends on the place of use. If you are looking to buy a headphone for only active noise cancellation, then you can be disappointed with the performance. The other features of the headphone are better as compared to this feature. Still, it is good enough for public transport as there is no leakage in sound. Beats Studio 3 headphone excels in the design, as it is not only stylish but also compact. It’s an eye-catching wireless design that is great for studio performance. The control scheme of the headphone is good and this is where it scores as compared to other headphones in this range. The design is indeed trendy and you can flaunt it with style. The build quality of the headphone is sturdy so you will not face any issue even if you use the headphones outside. In fact, it is so comfortable that you can use the headphone for your long gym sessions. With a closed ear look, Beats Studio 3 headphone is an average sounding headphone. The bass base of the headphone is amazing and it scores well for the bass base. The treble in the midrange is also good. The low-frequency range of the headphone is average. On higher frequency, there can be some distortion and leakage problem. There can be a problem with the different range of music genres at times. The soundstage performance of the headphone is average and not so good. The sound can break at times because of this. The sound quality is good according to price but not that great. Beats Studio 3 headphone has a great battery life and the playback time is good. The headphone gives you up to 22 hours of battery backup without any disturbance. 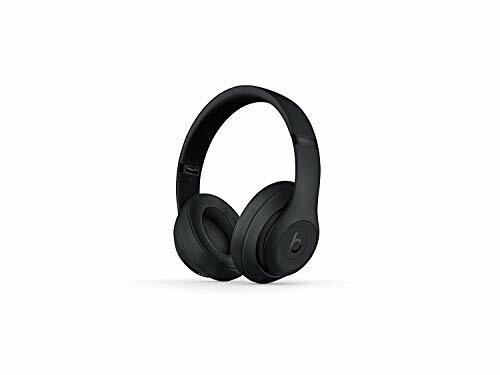 This works well with wireless connectivity and active noise cancellation feature both. If you switch off the mode, then the battery can last more than 40 hours. If you need a headphone for pure music listening, then this is the best choice for you. The battery can be replaced and recharged too. It also has an amazing fast fuel technology that lets you charge the battery in no time. With ten minutes of charging, you can enjoy 3 hours of playback time. It has good bass performance. Beats Studio 3 headphone is an average headphone with good sound performance and battery life. If you expect too much from the headphone, then you might be disappointed somewhere. The look of the headphone is stylish and the connection is also good. But, the fit can be a problem for many people. Also, the noise cancellation feature of the headphone is not that great. It blocks the sound of the environment but does not give you complete isolation. The best part about the headphone is that it’s available in many color options. The Bluetooth connection of the headphone is stable and that makes a big difference. For the price, the features could have been better. Still, you can go ahead and buy it for its battery performance and bass sound.